What, exactly, is a resolution? Resolution defined is the act or process of resolving – the act of answering, the act of determining. It is the act of resolving something. It also means the measure or sharpness of an image. When you make a resolution you are making a declaration, a stand, a commitment to embark on resolving something. Beginning a new year. . .
How do you create resolutions that transform your life? Traditionally, most people make a resolution to resolve an issue in life. These are classic – the resolve to loose weight, exercise, save money – for example. We all have been there. We are not taking the traditional path my friends. We are not taking a stand to resolve problems in our lives. Honestly, you know how that will go. Right? We are going to embark on resolving how to create an inspired life. For the next five days (and the year beyond) you will be deeply engaged in the act or process of creating an inspired life. Will you create goals? Of course. But we will go much deeper than that. Looking towards new visions and goals . . . I am inviting you to join me in the 3 Percent Club! Woot! Really, this sets you apart. My challenge to you is to stay with the process ALL YEAR. 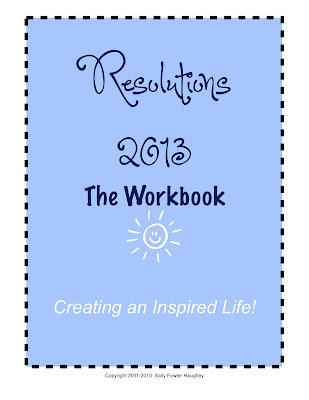 I will be posting every day this week a host of tools and workbooks for creating your new year. Reflecting on what has happened. . . Okay. I will not be approaching resolutions in the typical way. We are going to approach it in the way I know works and what has worked for me for years. Today we are taking step one – completing 2012. Being complete with 2012 does not mean you are finished. Rather it means you are at peace with the outcomes you experienced or did not experience. I believe one reason resolutions typically do not work is because people do not take stock of the previous year. Celebrating last year's wonders. . . There is this incredible feeling of being whole and complete when you take responsibility for how your year turned out. Being responsible means you are responding powerfully and authentically to life. Your First Task: Print your workbook. Complete 2012. Read the tips at the end of the workbook. Check back tomorrow for more tools to start your New Years. Leave a comment below and share one of your celebrations from 2012. I am celebrating making the investment in starting my Master’s degree at Antioch University! It took something and it was so worth it. This is an incredibly thoughtful and helpful post. Thank you! I returned to Kindergarten and survived 2 in college! Woot! I have been through 3 children in college – it’s a big deal! Sally, you never cease to amaze me with your ideas, your words and your wisdom. I am going through difficult times and your new year resolution idea is helping me. Thanks a lot for sharing!